Beautiful faucet. very happy with the style and the way is made. I bought another for an anotehr client and was installed without issues. Very happy that I found it here. Designed for powerful performance and lasting style, Artec Pro™ simplifies everyday tasks with a multifunctional design featuring a pre-rinse sprayer to blast away food residue and a rotating pot filler for quick fill-ups of pots and pitchers. Dimensions 9.8 In. X 4.1 In. X 24.8 In. Shipped on original box and arrived on time. Quality is superb. 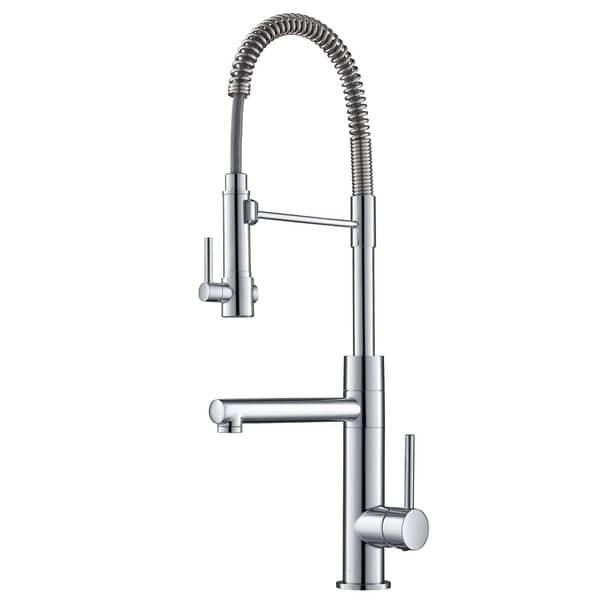 It is made of good quality stainless steel and easy to install. No leak so far which is good. Design is modern/contemporary which fits my style. Pot filler has good amount of water flow and sprayer is good. Magnetic dock is strong and holds the sprayer well. Highly recommended. I received this faucet in spot free stainless steel. Its actually in a laundry room and works perfect! High quality and better than expected. Love the design of this faucet and its two water options. First time buying a Kraus faucet and find the quality very nice. The finish is a perfect match for the Viking appliances in my kitchen. This is my first time buying and installing a Kraus faucet myself. Installation is a breeze. Great build quality. Solid feel when operating the levers. This faucet is well made! The color is not as bright as the picture it is a bit more subdued subdued. I looked up the Kraus brand and they seem to really stand by their products. It arrived much faster than stated and was well packaged. We just were looking for something a bit brighter gold to match with our hardware and style of of kitchen. This faucet is AMAZING! The water pressure is perfect! I like that it has two separate water dispensers. The finish is so luxurious looking and has added a rich feel to the kitchen. I highly recommend buying this! You won't be disappointed! Really nice, good flow with the option of restricting the flow further for water conservation. The spring on the spray handle doesn't move as much as I was expecting, but it doesn't really take away from the use of the Faucet. This is so nice. Everyone says my kitchen looks like a commercial kitchen with my new faucet. I bought the mix black and stainless. It's look fantastic. Gorgeous faucet. Magnificently large and heavy and solid. This is no $99 special faucet from Lowe’s or Home Depot. Definitely recommend this kitchen faucet. "Where is the default water flow when turning on the faucet? I'm assuming it goes to the pot filler and then you depress the spray to transfer the water there. Or can you use both simultaneously?" Hello, Thank you your inquiry. Please be advised the main faucet is the potfiller. Once you press onto the sprayer the water will diverter from potfiller to sprayer. You would not be able to use both at the same time. "Just received my faucet. Install was quick and easy. We flushed the sprayer but the pot filling arm is dripping. Just a drop at a time but it’s been consistent. We opened the sprayer and released any water but still leaking What’s the problem? " I reached out to Kraus directly about this issue and received the following response "We apologize the customer is having that issue and we can assist but we would need a visual. I have created a case under #181369 and we would like for the customer to contact us directly. We can be reached at 1-800-775-0703 or customerservice@kraususa.com so we can better assist."